There are plenty of examples of jazz musicians re-interpreting the classical repertoire, exploring the overlaps and debts owed, or simply absorbing and expressing the influences in their playing. This release by Berlin-based Russian pianist Kirill Gerstein comes from the other direction. Gerstein, a firmly established and widely lauded performer in the classical world, has a strong affinity and appreciation of jazz, having studied at Berklee as well as a succession of international conservatoires. The collection of performances, recorded live over a five year period, are Gerstein bringing that sensibility to Gershwin’s written music. Rhapsody in Blue, the jazz band version, and Concerto in F are performed with the the St. Louis Symphony Orchestra and their conductor David Robertson. Etudes, written by Earl Wild for piano render Gershwin’s Somebody Loves Me, I Got Rhythm and Embraceable You as virtuosic excursions. Summertime is a duet with songstress Storm Large and Oscar Levant’s Blame it On My Youth is another duet, this time with the legendary Gary Burton on vibes. This all adds up to an appreciation and celebration of Gershwin’s music and an active exploration of how jazz and African-American music shaped his and other composers’ writing. Extensive accompanying notes by Joseph Horowitz observe how it is only since the 1990s that Gershwin has become part of the mainstream repertoire for American orchestras. The duets are beautifully played. Storm Large has a rich, bluesey voice and Gerstein takes a short and well-balanced solo on Summertime. It’s the big pieces that really unleash Gerstein’s passion however. The concerto positively crackles and the candenza is his own. The Etudes produce some pyrotechnics, I Got Rhythm is a fusillade of notes with the famous theme ringing like a bell in the midst of it all. Gerstein achieves his aim with this recording of "striking a delicate balance – not too classical, not too jazzy". 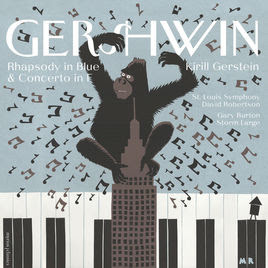 If you fancy a "Gershwin moment", this is a recording too seek out.